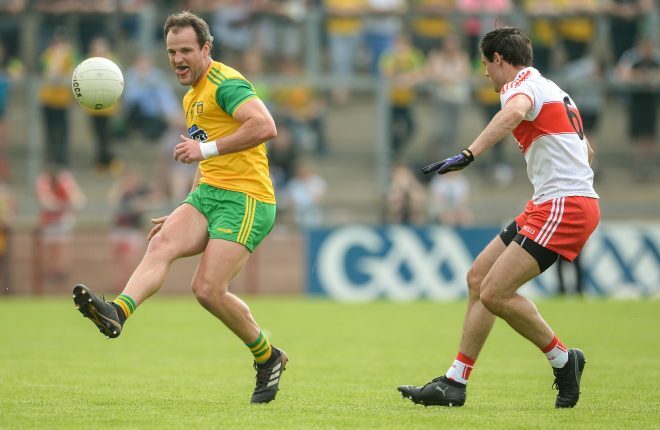 Donegal GAA enjoyed a great day in Celtic Park last Sunday with two big results against Derry. The Under 20s got things off to a super start with an impressive victory over Cavan, and the seniors then backed that up with a deserved win against Derry. It’s not easy playing away games in Ulster, but our lads handled it well, and they are learning all the time. We have two good wins under our belts now and we would be pleased with the tallies we have racked up in both of those outings. We had a number of good performances and it was good to see Hughie McFadden getting up the field to score a goal, and Cian Mulligan made a big contribution when he came on again. He wasn’t the only Gaoth Dobhair man to do so, as Odhran Mac Niallais and Dáire Ó Baoill also played their part. Leo McLoone and Patrick McBrearty were in top form, but there is nobody resting on their laurels. We’re far from the finished article and we still have a lot of work to do to get the blend right. We know there are areas that we have to improve in, but the lads are all working hard and we are focussed on the semi-final with Down in two weeks. A couple of the lads went off with injuries and we will analyse them over the weekend. There’s nothing really major, but the problem this year is that you only have 14 days to get the body right, and that’s not a lot of time. We’ll know more in the next week. I want to give a special mention to the Donegal support last week because I thought they were brilliant. People were in early to support the Under 20s, and we must have outnumbered Derry by six or seven to one. It gave everyone a great boost when we came out of the dressing room and saw green and gold everywhere, and it almost started to feel like a home game. The team really appreciated the support, and hopefully people will come out in force again when we play Derry. I’m sure Gary McDaid and his Under 20 team were delighted with their championship opener last week. It’s always that wee bit easier at minor level because you have a league campaign, and a chance to tweak things and try out new lads in different positions. The Under 20s didn’t have that, and they just had to go on a couple of challenge games and their own in-house training sessions. However, they were really sharp last week, and were much too strong for Cavan. 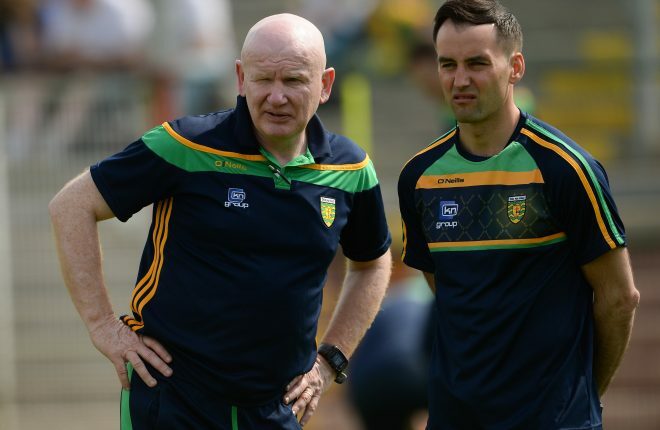 Donegal have put in a lot of work on the training ground, and they were very well-organised. Niall O’Donnell scored 1-12 and that was a fabulous contribution, and I don’t know if anyone has ever posted that type of individual score before for Donegal’s footballers. You might get it in hurling the odd time, but very rarely do you see a Gaelic Footballer having such an accurate day in front of the posts. It was good to see Jason McGee back playing after his injury woes, and he will be vitally important this week when they play Derry. I would imagine the Under 20s will get a much stiffer test this week, but I would still expect them to win. Mickey Donnelly is in charge of Derry after a previous spell with Tyrone minors. 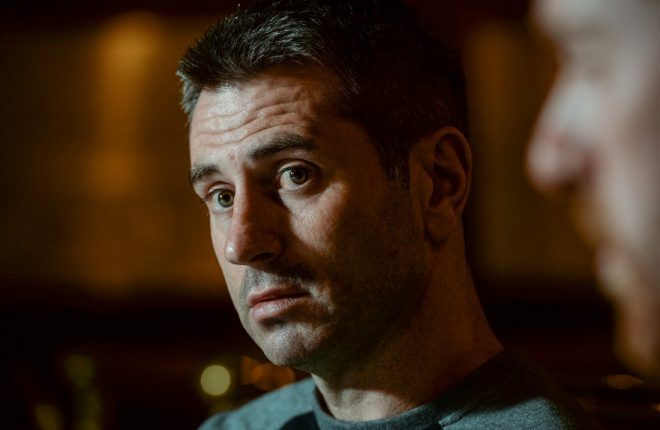 He has been lamenting the fact that he has lost a few players to the Derry senior squad, but he will still have a strong side at his disposal. There are only seven days to get ready for the Derry match, but you can be sure that the backroom team have plenty of homework done. You have to plan ahead at this level, and they will know a good bit about Derry I’m sure. Gary and his management team will just be making sure that they hit the same performance levels again, and if they do, I can see them qualifying for the semi-finals. It would be great to have them in again with the seniors on Sunday week in Clones. Down produced a decent performance to get the better of Antrim last week. They have a number of strong pacey players that break through from defence like Caolan Mooney and Darren O’Hagan. Connaire Harrison is a handful at full-forward, and Donal O’Hare will kick plenty of scores. 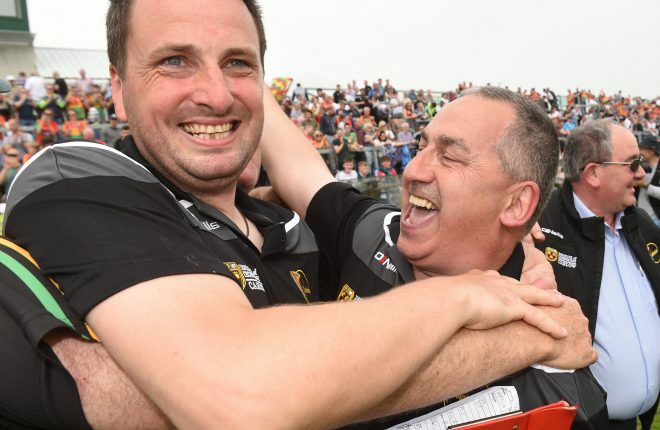 They were in the Ulster Final last year, and they’ll be aiming to get back there this June. The big result last week was that Carlow defeated Kildare and few could have predicted that. Longford also had a terrific win over Meath, while Dublin made light work of Wicklow. The Leinster Championship is a funny one. Dublin are miles ahead, but there doesn’t appear to be any great difference between the rest. My own opinion is that the provincial championships have served up a lot of entertainment so far this year. You had Monaghan beating Tyrone in Ulster, and Fermanagh seeing off Armagh. Cork produced a big display against Tipperary last week when they were written off, and there have been a couple of tight games in Connacht going back to New York’s narrow win against Leitrim. It’s probably been the best month of championship for many years, and yet we have seen next to nothing on the television. I think it’s an absolute disgrace because it is our national game and we should be showcasing it all the time. RTE have only shown one football game on the box so far this season, which is not good enough. There will be more in a few weeks, but the World Cup will soon be on, and we will be battling for exposure once again. There is a huge appetite to see our games, and yet we’re only at the tip of the iceberg with it really. We’re getting two or three minutes of footage on the Sunday Game, and then a little bit of analysis, and frankly that is not enough. I know there are contractual requirements involved and RTE can only show so many games. But there is a real imbalance regarding the amount of Gaelic Football that is being televised in comparison with the hurling championship. Something has to be done about it because the GAA are not looking after their supporters. You might have people in Carlow that are physically not able to go to a game, or couldn’t get out of work, or had a family event or something, and they missed an historic match last week, and all they get is two minutes of highlights. Every single game is being videoed these days and there has to be a way that a full game can be put online during the week for people that may have missed it. That couldn’t be too hard surely? The GAA really need to get their act together on this one. 45 lives games between two sports, with just one highlights programme and no magazine style show simply does not suffice. It seems strange to already be looking forward to an Ulster semi-final, but the whole Championship is being run off much quicker this year. Rory Gallagher’s Fermanagh will go in as underdogs for the game with Monaghan but they will believe that they can win the match. The Farney county produced a really impressive performance against Tyrone in the quarter-finals and you would have to expect them to have too much for Fermanagh but it should be an interesting game. There was a big margin when the two teams met in the Preliminary Round last season, but it will definitely be a lot closer this time around. Fermanagh have nothing to lose, but you’d have to expect Monaghan to come through. It’s a big weekend for the Downings club as they host the National Finals of the Comortas Peile na Gaeltachta. I know they have been praying for good weather down there, and hopefully it won’t be too bad. The Downings club have put in a huge effort to get ready for this weekend, and I’m sure they will be plenty of craic down by the seaside. There are a lot of teams coming from all over the country and there should be plenty of competitive matches. There’s also good news in that the two senior semi-finals on Sunday and the Junior and Senior deciders on Monday will all be live on TG4. We have seen so little Gaelic Football on the box over the last few months, so I’m sure gaels will be tuning into Downings from all over Ireland.